Savvy executives are now using proof-of-concept trials to test-drive member/donor management systems before buying. In the "Proven Strategies for Evaluating Member/Donor Management Systems" whitepaper, you'll learn more about how to use your own data and processes in a real-world testing environment to thoroughly vet a potential new system your organisation might utilise for the next 7 to 10 years. 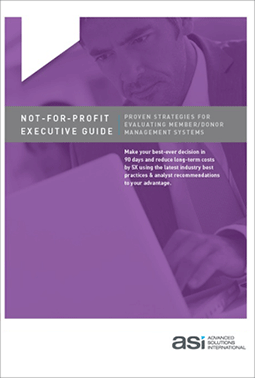 With these best practices, you can complete the selection process in just 90 days or less.